What's New in this Lightroom Release > Lightroom Classic Updates > What’s New in Lightroom Classic CC 7.2 (February 2018)? Lightroom Classic CC 7.2 has been released today. This release makes significant performance improvements and adds a few nice new features, as well as the usual new camera/lens support for Lightroom and bug fixes. The entire Lightroom CC ecosystem has also been updated. When Adobe announced Lightroom Classic last October, they promised they were going to focus on performance improvements. Performance requests (or complaints!) usually fit into two main categories: interactive performance (how quickly Lightroom responds to your actions) and batch processing performance (how efficiently Lightroom uses the computer’s resources to do things like building previews). In this release, the focus has been on improvements to batch processing tasks, so you’ll see improvements in the speed of Import grid loading, importing photos, building previews, stepping through photos in Loupe view, rendering adjustments in the Develop module, merging panorama/HDR photos and export. You should see improvements on most computers, to varying degrees, but they’ll be most noticeable on powerful computers, especially those with a high CPU core count or more than 12GB RAM. This means that even on slightly older machines, you may be able to improve performance by adding extra RAM, which is an inexpensive upgrade. The system requirements have been updated to recommend 12GB of RAM, although it will still run with a minuscule 4GB. Just for fun, we went back and compared the results from this new 7.2 version of Lightroom Classic CC to the old Lightroom CC 2015.12 using the Core i9 7940X. Comparing the two versions, exporting is now almost twice as fast, generating 1:1 Previews is about 5x faster, and generating Smart Previews is an insane 7x faster! Adobe has also fixed a frustrating bug which caused Lightroom to slow down over time, requiring a quit and relaunch to bring Lightroom back up to speed. It’s possible there’s more than one bug that can cause this issue, so the team wants to hear from anyone who can still reproduce it. Using a search field at the top of the Folders panel, you can search for folders by name. This is particularly useful if you prefer to use topic-based folders, rather than a dated hierarchy. 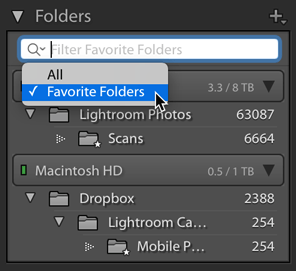 If there are folders you use frequently, you can now mark them as favorites by right-clicking and selecting Mark Favorite. You can then filter the Folders panel to show just favorite folders (and their parent folders) or select the folder by clicking on the Breadcrumb bar on top of the Filmstrip. 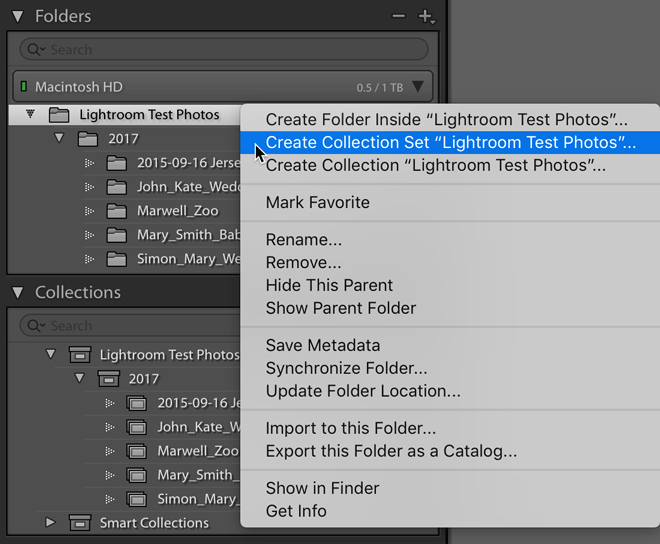 If you’ve been using a topic-based folder structure and want to migrate to Lightroom CC, you can now easily convert your folder hierarchy to a collection hierarchy using the Create Collection Set command in the right click-menu. Lightroom automatically creates an identical hierarchy using Collection Sets and Collections, so you can migrate to Lightroom CC without losing your organization. If you right-click on a pin or group in the Map module, you can now create a collection of the images shot at that location. You can now search for photos you’ve edited using Quick Develop, Develop module or Import Presets using the new Edited/Unedited buttons on the Attribute Filter bar and Filmstrip Filter bar, the Edit option in the Metadata Filters, or using a Smart Collection. Unlike the existing Smart Collection “Has Adjustments” criteria, the “Has Edits” criteria includes cropping. There are loads of bug fixes. Adobe only publishes the bugs reported by users. Thank you for this detailed information on the update. It’s far more than we received in the email announcement from Adobe! Please keep us posted on reports of stability of this version. Will do Art! Looking pretty good so far, but I’ll update the post if problems arise. Here’s a question regarding the edited/unedited filter: I used the button by the filmstrip to find the unedited photos in a folder. It worked fine. But, suppose I want to edit them? When I make an edit to a folder, its status changes, and it is no longer in the filter set. Suggestions? Add it/them to the Quick Collection temporarily, and you can work on it/them in there. When do you think support for HEIF and HEVC will be implemented? Or will this be probably long in the future? I know it’s definitely on their radar and they hit some issues that required extra time to implement, but I don’t have a timescale for you I’m afraid. I love the new search function in the folders. SOOO much easier to find stuff. That’s odd Andy. You’ve confirmed that it definitely updated to 7.2 ok (Help menu > System Info)? Might be worth posting your results on the bug report forum to figure out why you’re not seeing improvements, because on a Quad-core with 16GB, I’d expect you to see some improvement, even if just 10%. I wouldn’t hold out too much hope for that one Jlua. They’ve made it quite clear they don’t intend to add more sync functionality to LR Classic. Yeah, it’s not intended for syncing a folder hierarchy to the cloud in Classic. If they were going to do that, they might as well have just allowed folders to sync (but they’re not adding new sync functionality to Classic). The use-case for this feature was pre-CC migration. Thank you for the information regarding the new features. I am disappointed to learn that the tethered cameras feature still does not cover the Sony Alpha series. As On1 do not support them is it a technical issue or perceived popularity? Keep up your good work. As far as I know, Sony don’t offer a wired tethering SDK, and Adobe relies on the camera manufacturer’s SDKs. I have a slightly weird issue with the latest version of Lightroom classic CC, (well almost latest, I’m on 7.1, will update to 7.2 soon). 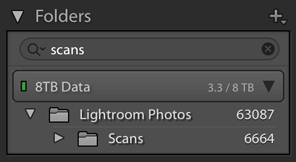 Anyway my issue is since Jan 1 2018 is whenever I import images directly from my camera into lightroom, using the import dialog, lightroom insists on creating a new folder hierarchy each time. For instance, I have a folder called 2018 and subfolders of January and February, I created these as the file system I would prefer to use, year and month, now whenever I attempt to import images I select the folder February and then import, as I have been doing for the last few years (different folders/years obviously) so I’m expecting my images to be imported to the 2018-Feb subfolder, which they are but Lightroom will create another 2018-Feb subfolder within my original folder hierarchy , slightly confused yet? So after import I will have the following 2018-Feb then 2018-Feb, 2018-Feb over and over each time I try and import. I’m currently addressing the issue by moving the images out of the folders I don’t want and didn’t create and into the correct folder then delete the newly created folders. Until next import where it will happen again. Sorry if that’s super confusing, I have a screen snip but don’t see anyway to attach here for a better explanation. Any tips would be much appreciated, otherwise I’ll just keep on moving and deleting rouge folders. As usual, excellent advice, thank you for saving me hours of rearranging. “Create a Collection Hierarchy from a Folder Hierarchy” – I like it since I always wanted to have my library on the iPad. Now with that (and enough cloud storage) it would be possible. Will the collection also be updated when I am working on the original folders afterwards? Unfortunately, “Create Collections from Map Pins/Groups” doesnt seem to work under Windows 7. Works fine under Windows 10. I’ve seen a bug report on that, engineers are looking into it. Once LR finds the folders with the word I typed, the metadata doesn’t appear and the spinning dots in the metadata panel go for several minutes before loading the metadata. The folders in the folder panel are likewise grayed out until the metadata loads. This is on an iMac 5K 2017 4.2 GHz Core i7 with 32GB RAM and Radeon Pro 580 with 8GB (graphics proc. checked in prefs) If I cancel the Folder Search the folders are greyed out again in the folders panel and take a few minutes to come back. It’s actually faster to just quit out of LR and reopen it. That Folder Search would be very handy but not going to use it until this is fixed. Hello thanks for your blog. It has a situation that persists for years in Lightroom. The higher the number of presets you have, the longer it takes to open the LR. How many presets are we talking about? The majority of the problems with large numbers of presets were solved some months ago, but very high numbers could still cause trouble. I’m not seeing the Folder Search or the Favorite Folder business after the update. I assume the update “took ” but I would find it delightful if somewhere I could see the number “7.2” so I’d know for sure. Any idea why I’m not seeing the fun new features? You haven’t upgraded to Lightroom Classic yet Owen, or perhaps you’re opening from an old shortcut. Check in the CC app for Lightroom Classic. Victoria, with all these new goodies coming on stream (especially auto-processing which actually works!) I think the time has come for me to upgrade from old Lightroom ‘Perpetual’ to Classic CC – even though I’m quite unlikely to make much use of the web capability. I seem to recall that you somewhere posted up how to achieve this – and a link which earned you a percentage on the deal! Can I find it now . . . ! Thankyou for your guidance. >>You haven’t upgraded to Lightroom Classic yet Owen, or perhaps you’re opening from an old shortcut. Check in the CC app for Lightroom Classic. Ok, I feel dumb. I had no idea the “upgrade” to 7.2 was actually the installation of an entirely new executable. I did a few hours of editing using my “old” pre 7.2 installation last night. Q: what would be a clever way for me to get the work done last night into the new catalog? Should I simply try to open the old one in the 7.2 app, and it will trigger a catalog conversion? Yep, opening the old catalog on 7.2 would trigger the conversion process. Or File menu > Import from another catalog would allow you to transfer the data in, if you’ve been working in this upgraded catalog already. Victoria suggested rebooting the computer and that worked. I tried everything else but that. Thanks, Victoria! I have a late 2013 27″ iMac running MacOS 10.13.3 with 8GB of RAM. I know you’re only meant to see improvements with over 12GB of RAM but it was running ok for about an hour after upgrade and now it keeps crashing within seconds of opening. Over and over. I can’t use it. Any tips? Do I literally have to go buy more RAM? That’s a weird one Gordon! More RAM would no doubt help with performance overall, but it should still run with 8GB. You literally open it and then it crashes? Or it crashes when you try to do something? It started when I was just clicking between images in Library. Then after it crashed a couple of times I restarted the computer and launched it. Without touching anything it crashed. It did that a few times so I uninstalled it and tried to install LR 6 from the CC Apps menu but it installed 7.0. That was a few mins ago. It’s working at the moment and I’m not going to touch it. Before when I upgraded from 7.0 to 7.1 it slowed right down and kept freezing on “Calculating…” image previews. Not sure what do do really. I’m having the same problem as Gordon now after the update!! I haven’t done any timings, but I don’t think I’m seeing any improvement in browsing speed in 7.2. Even working with 20MP jpegs with 1:1 previews built, it’s not particularly fast going from shot to shot via the keyboard, and every few frames, the preview area goes blank for a second before filling in the next shot. It might be faster building smart previews, but the browsing/culling experience does not seem to be improved to a noticeable degree. This is on a 2017 4k iMac, 3GHz i5 w/16GB of RAM, catalogs on an SSD. Interesting – I just noticed that browsing is actually smoother in Develop than in Library (exactly the opposite of what I would expect); discovered by accident when I popped into Develop to crop a panorama, and forgot to switch back before browsing from there. Noticed that there were suddenly no pauses browsing from shot to shot, and no blank screens after several shots, then noticed I was still in Develop. Perhaps this is connected to the metadata loading issue noted above? Maybe loading the metadata is causing the delay in Library? That’s a little unexpected, so I think it would be worth reporting. Thanks – just reported it. I don’t hold out much help Dennis, and I’m an Olympus shooter like yourself. Classic 7.2 is not significantly slower nor faster than LR standalone 6.14. Imported 126 RAW files from CF card (Canon 7D Mk II CR2s) in around the same time that 6.14 would have done. Have not yet exported in large quantities to jpg. At this time I am using a catalog named TEST with only a couple of hundred raw files. Yeah, it’ll be interesting to see your export timings. Import will be partly limited by the speed they can be copied off the card, of course. I am totally confused in the meantime. According to Adobe Lightroom Classic CC is the desktop version and Lightroom Classic is the cloud version. I have the desktop version 6.14 and there isn’t any update für MacOS. Did I miss something? Adobe’s business policy is a little confusing. I think they want everyone to buy the cloud version. Don’t worry Knut, everyone’s confused, so you’re in good company. Lightroom CC = the brand new cloud-based service for desktop and mobile devices. The Adobe naming convention is confusing. 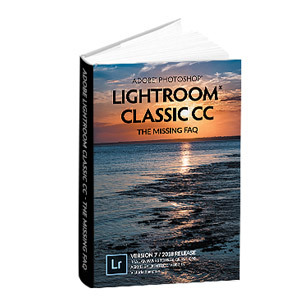 You are correct: Lightroom Classic CC is the desktop version. The old standalone (perpetual licensed) versions of Lightroom are no more and will no longer be updated. The only versions to be updated in the future are the CC (Creative Cloud) versions which are available only by subscription. But.. one aspect takes very much longer, creating a catalog backup. It takes now almost twenty minutes on a reasonable recent Windows desktop. I am pretty sure it used to be much quicker before. Especially the integrity check and optimizing previews take so long that I expected a hang-up. It is somthing you can live with, but hopefully Adobe can repair this. If I am the only one experiencing this, I would be interested in a good suggestion. Here’s something I spotted since upgrading to 7.2 . A number of my JPEG files seem to have had their metadata updated. I realised this when I saw some unexpectedly large sized in my regular backups. I think there has been some kind of update in the catalog and the the data written back to the files. I can’t work out what the changes are – the files seem random and not ones I have been working on, not in specific collections or tags or…. And I can’t work out what metadata has changed. Do you have automatically write to xmp enabled in Catalog Settings? Good question. I did turn it on, then changed my mind, as I was reviewing settings spot-upgrade. So that may have caused it, rather than the upgrade itself. But would this cause JPEGs to be updated – I thought this was for RAW sidecar files? Ah, no, all file types. XMP is stored in a section in the header of the file for JPEG/TIFF/PSD/DNG etc. or a sidecar file for proprietary raw. Ah yes, of course. I’m still not sure what kicked off the updates, but maybe there were some outstanding metadata write backs. Thanks Victoria for yet another excellent article. 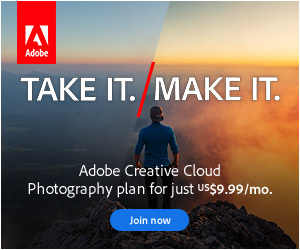 Despite Adobe’s efforts, I think it’s a huge step back. I went from 2015.14 to 7.2 on a Macbook Pro 15″ Late 2013 Retina w/ 2.3GHz / 16GB RAM. On 2015.14 I can quickly navigate through images by pressing the right/left arrow keys repeatedly. On 7.2, there are major hiccups every 5 or 10 images, where it seems like LR needs to build a preview from scratch. Of course I made sure to generate 1:1 previews for all images in the folder in both versions. The speed I’m navigating easily through my images in 2015.14 is about 5 images per 2 seconds, which is not unreasonably fast in my book. I haven’t tried 7.2 at all other than this navigating, because quite frankly if this doesn’t go smoothly then I’m not interested in what else there is.. I quickly renamed my previews folder back to the name before catalog upgrade (removed the “-2”) and I’m now back on 2015.14 to be able to work. I use this tool professionally so I need it to work fast. So instead of speed improvements it’s really lagging. And my machine is quite fast and has 16GB of RAM. Are there more such reports? There have been a few, so there’s clearly some more work to do. Since Classic and 2015 can both be installed at the same time (using separate catalogs), it would be worth reporting to Adobe at the Official Feature Request/Bug Report Forum at https://feedback.photoshop.com/photoshop_family/topics/new/add_details?topic%5B so they can figure out what you’re seeing these issues and others aren’t. “a few” is in respect to the “sluggish” functionallity of 7.2 an understatement! If you dive into different froums like Photshop Family and even Adobe’s own HelpX, you see long list of posts to this subject. This “memory leaking” has been widely discussed. Testing both versions on import and export speed show no signifanct differences (only a few %), so anybody experiencing things like Selwin points out, should try to roll back at version 7.1 or 7.0 …. The forums give quite a distorted view of the number of people having issues, because the happy people rarely post that they’re happy. They clearly still have work to do, but it’s still a relatively small number of people seeing issues. Not freeing the memory is expected behavior at this point. 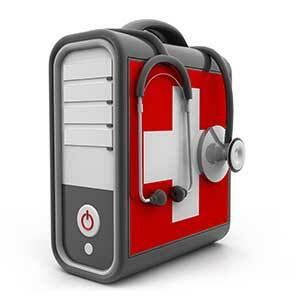 It retains it for continued use, but should return it to the OS if another program needs it. If other programs are suffering, then there’s a problem. Your link to report a bug only takes me to a page where you can complain to other users. It is not an Adobe bug report submission page. Believe it or not, that IS the bug report form. 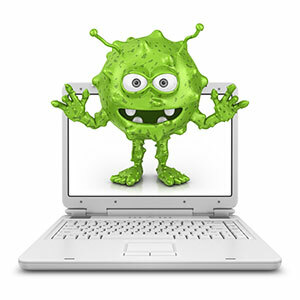 It looks like a forum and acts like a forum, but the engineers track the bugs reported there. The benefit of it being public is that other people can vote on feature requests, so Adobe can get a feel for how many popular a new feature might be, and gather additional information about bugs. Often it’s gathering clues from multiple people that helps them reproduce and then fix bugs. They can also report back when a bug is fixed, so it works much better than the traditional “black hole” kind of bug report form.